We have pizza night once a week. At least. And then there was that time (last week) when some magical switch flipped and my husband became completely obsessed with making pizza himself. HIMSELF. A glorious week, it was! Jason brings dependability and stability to the relationship – and pizza nights 🙂 – with sausage and pepperoni. A wild night calls for fresh jalapeños but it’s always sausage and pepperoni. And me? Trying to narrow down my favorite pizza toppings is like… trying to narrow down my favorite pizza toppings. Fancy cheeses, roasted veggies, and lots of goat cheese abound. I’m always in the mood for something a little different. And this pizza fits that bill perfectly. 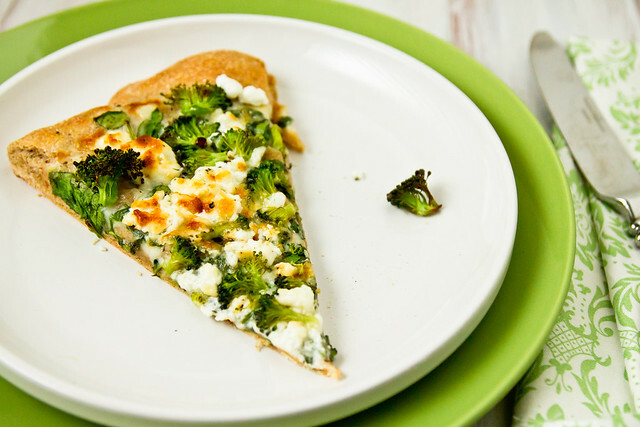 The Spinoccoli is a white pizza topped with baby spinach, broccoli, mozzarella, and cheddar. We swap out the spinach with Central Market’s herbed baby spinach-arugula mix (because I love that stuff) and substitute goat cheese for the cheddar (because I love that stuff, too). And because there’s no such thing as too much goat cheese. 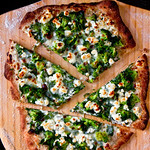 Top your favorite pizza crust with fresh spinach, arugula, broccoli, and goat cheese. Spoon white sauce onto the pizza, spreading with a spoon almost to the edge of the dough (you'll probably have a little sauce leftover). This sounds so yummy! Goat cheese makes everything wonderful. I love how you cut it! Just gorgeous. oh. my. This looks DELICIOUS!!!!!! Looks amazing! And that pizza crust! YUM! This pizza is right up my alley!!! I look forward to making this!!! Pizza night is something that my husband would love! If only he would catch on like your husband and make it himself :). I’m in LOVE with that first picture! Like I want to blow it up and hang it on my wall. And I love the way you cut it. So creative and un-traditional! I’m going to call everything I serve my family “spinoccoli” from now on instead of “roasted veggie” this or that. They’ll love it. Almost as much as I’ll love this pizza! Yum. I LOVE that first photo! LOVE it. And I am so happy you are pizza people too. . . I read almost every post of yours, and I feel like you’re so much more gourmet and inventive than I will ever be. . . but we have pizza night every week at our house. It’s nice to know we’ve got something in common! That looks like a great way to eat vegetables. We make pizza on Sunday evenings and that’s my husband’s cooking night so I will have to subtly push this recipe under his nose. I am drooling over these photos. That’s so fun that your husband got into making pizza himself. And yes fancy names like Spinoccoli makes it sound better than “veggie pizza”. I heart you… your my new bff. And not because this is a recipe for pizza (seriously, who doesn’t love pizza), and not because you can’t narrow down your pizza toppings, (because anyone that say’s they can is lying), but because you said “there’s no such thing as too much goat cheese” Yep, friends forever. 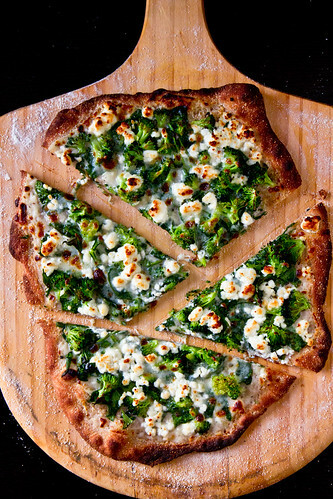 I have to admit that ‘green’ pizza’s are my fav, so thank you very much for sharing this combo. I just made a batch of Jim Lahey’s pizza dough and it’s now got these toppings written all over it! DELICIOUS!!! I made one change though – I substituted carmelized onions for the broccoli (didn’t have any on hand, but had a bag full of onions). When I was cooking the onions I threw in the spinach with some chopped garlic during the last minute, so all the flavors could come together. The result was unbelievable. And I couldn’t agree more…there is no such thing as too much goat cheese. Ever. Thank you very very much for this great and delicious recipe. I made it two days ago, and me and my friends just loved it! !